I added a Cisco router (switch) as device in PRTG. When I try to add an SNMP sensor (e.g. SNMP Traffic sensor) to it, some interfaces/counters are missing. Entries for ethernet and serial port are missing. Or: I get an error message saying « No Such Name (SNMP error # 2) ». What can I do to see all interfaces of my device? In the PRTG web interface, choose your Cisco device from the device tree. 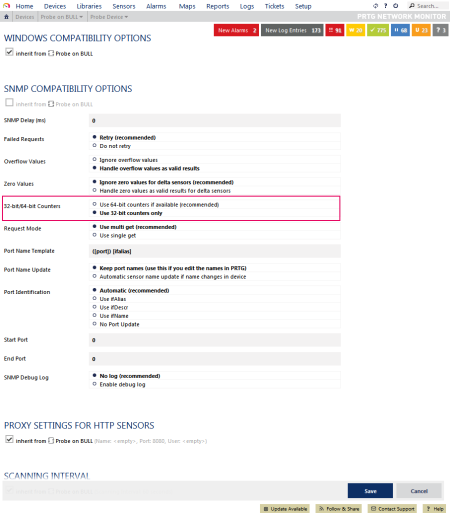 Scroll down until you see the SNMP Compatibility Options entry. Uncheck inherit from .... You can now change the compatibility options. In section 32-bit/64-bit Counters, select the option Use 32-bit counters only (see screenshot below). Adding the counters should now work. Please remember to turn off the 32-bit option (i.e., choose Use 64-bit counters if available) after adding the sensor. Note: If a lot of traffic is going through your the 32-bit interface, please make sure you select a small scanning interval to prevent a 32-bit overflow in your device. An overflow would cause your device to overwrite its own monitoring data before it is sent to PRTG and therefore lead to incorrect data. A 32bit counter can store a maximum of 2^32 bytes. This solution also works for routers with a lot of interfaces, where the "higher" interfaces are showing up when scanned, but will not show/report any data and have state "Down" after being added.